We’d love your help. Let us know what’s wrong with this preview of In a Galaxy Far, Far AwRy book 1 by Liam Gibbs. In the galaxy of Stratus Cloud, commerce and advertising rule every aspect of life—up to and including Intergalactic Protection, the galaxy’s foremost source of military might and occasional law enforcement. Military uniforms and weaponry all bow to the whims of corporate sponsors. For five days only! Fifty percent off space cruisers! Buy two and get a free blaster for the In the galaxy of Stratus Cloud, commerce and advertising rule every aspect of life—up to and including Intergalactic Protection, the galaxy’s foremost source of military might and occasional law enforcement. Military uniforms and weaponry all bow to the whims of corporate sponsors. For five days only! Fifty percent off space cruisers! Buy two and get a free blaster for the kiddies! But beneath this money-grubbing surface lurks another faction equally obsessed with profit. Only infighting prevents these underworld criminal organizations from controlling the galaxy. It’s a delicate balance with which no one is crazy enough to mess. No one, that is, except for Master Asinine, whose name sums up his personality. He’s decided Stratus Cloud needs to remember his golden rule: whoever has the planet-destroying laser wins. And, as luck would have it, Asinine just happens to have a planet-destroying laser. Go figure. To ask other readers questions about In a Galaxy Far, Far AwRy book 1, please sign up. This was a really fun and comedic space adventure. It felt like a blend of British sci-fi like Red Dwarf and the Hitchhiker's Guide to the Galaxy, and 90s comics like the X-Men. The story follows Legion, a military man (alien?) who gathers together a group of hyper-beings with powers to defeat the evil Master Asinine... yes you read that right. It has great satire and really unique characters. 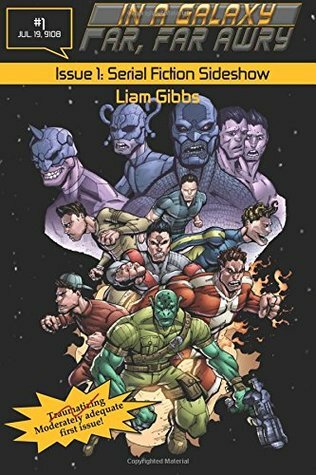 I love that this book, the first in a series, is a reboot of a novel Liam Gibbs wrote - but never publi This was a really fun and comedic space adventure. It felt like a blend of British sci-fi like Red Dwarf and the Hitchhiker's Guide to the Galaxy, and 90s comics like the X-Men. The story follows Legion, a military man (alien?) who gathers together a group of hyper-beings with powers to defeat the evil Master Asinine... yes you read that right. It has great satire and really unique characters. Really enjoyed this read! Definitely fits my type of humor!! ;D Looking forward to reading the rest of the series!! Liam Gibbs knew he was destined to write at age four, when he authored a breathtaking account of a cow who ate grass. The bovine saga failed to catch the public’s eye but earned the budding author parental acclaim. Since those early times, he’s gone on to write the novella Not So Superpowered and humorous articles for various magazines. A twenty-year veteran of the brutal world of hand-to-hand comi Liam Gibbs knew he was destined to write at age four, when he authored a breathtaking account of a cow who ate grass. The bovine saga failed to catch the public’s eye but earned the budding author parental acclaim. Since those early times, he’s gone on to write the novella Not So Superpowered and humorous articles for various magazines. A twenty-year veteran of the brutal world of hand-to-hand comic book fandom, Gibbs cut his teenage teeth on titles such as Spider-Man, X-Men, New Warriors, and other Marvel comics. Gibbs graduated college with a degree in professional writing, which included classes on fiction writing and story structure. He lives on the balmy shores of Ottawa, Canada, where he relaxes by watching staggeringly awful horror and science fiction movies. A health and fitness nut, he shoots lasers from his eyes, uses the word exclusive incorrectly, and once wrestled an exclusive brontosaurus. True story.